It was victory for football and po' boys when Yats, a much-missed traditional po' boy shop, reopened last week with a New Orleans Saints launch party. After a few gigs around city (most recently at Annie's Bistro), Yon Davis, a proud New Orleans native, is now operating out of at The Boardroom, a laid-back sports bar in North Beach. 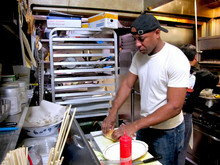 Davis' Southern dishes go hand-in-hand with his love for football and beer. Thus, the Yats menu will be available at the Boardroom on Saturdays and Sundays, as well as Monday evenings, with football playing in the bar. The combination could make for a rowdy night when the New Orleans Saints take on the 49ers during Monday Night Football on September 20th. Davis was a real estate agent and photographer in New Orleans before Hurricane Katrina. After the storm, the housing market crashed and Davis saw opportunities in San Francisco. He was working as a server at Gary Danko when a friend asked him what food he couldn't live without. The answer was simple: po' boys. Well, there's no craving like hunger, and to appease that craving, Davis decided to open a traditional New Orleans style-po' boy shop in the City by the Bay. With no formal culinary background, Davis set off to train under the sous chef at Commander's Palace, a respected New Orleans restaurant. While he was home, he picked up some tricks of the trade, along with some down-home recipes from friends and family. 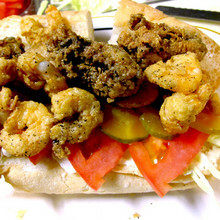 Po' boys originated in New Orleans in 1929, during a street-car workers’ strike. A local bread company decided to feed those “poor boys” with free sandwiches that were appropriately dubbed, “po' boys”. The original po' boy subs were stuffed with French fries to make them filling, yet inexpensive during the Depression. Davis features the Original ($6) on the menu and says customers often order it without reading the description. All fillings aside, when it comes down to it, a good sandwich has to have good bread. Yats' flies in Leidenheimer bread from New Orleans to give that extra edge of authenticity. “San Francisco has sourdough, New York City has their pizza dough, and New Orleans has French bread,” Davis says. The bread, which can be ordered as a bun or eight-inch roll, has a lightly crunchy shell with a melt-in-your-mouth center. On the Shrimp Po' Boy, the fried crispy shrimp is well seasoned and brings a sharp bite of contract to the cool, crisp dressings — lettuce, tomatoes, pickles and a generous spread of mayo. Together it's the perfect ratio of proteins, veggies and bread that every sandwich strives for. Like a good game of football, these flavors are hard-hitting. And while the deep-fried goods of Louisiana are embraced by the Bay Area, Davis knows Californians are health-conscious, and he aims to please. Davis will launch a new line of “Po' Girl” sandwiches this Saturday, in addition to the Po' Boy of the Week. The Po’ Girls, which real men shouldn't shy away from, will highlight lighter, modern flavors, on a pressed bun that is easier to bite into. The grilled portabella with French onion dipping sauce is sure to be a favorite. While the Po' Boys may be the QB of the team, let's not forget the other players. 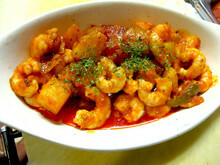 The Seafood Gumbo ($8), Duck and Sausage Jambalaya ($10), and Spicy Shrimp and Potatoes ($10) offer tasty alternatives.